From feeding people to composting, there are many environmentally preferable options for diverting food and other organic waste from landfills and incinerators. Organic waste includes food waste, compostable plastics, and non-recyclable paper products like paper towels and napkins. By reducing or diverting food and other organic wastes, you can reduce your environmental impact and avoid expensive disposal fees. Consider sources of organic waste and ways to reduce this waste at the source. For example, reusable plates and utensils may eliminate the need for disposable options. High-efficiency hand driers may replace paper towels. Menu planning, portioning, inventory control, and consideration of preparation practices in the kitchen may reduce food waste. Edible food waste can be donated to food banks and similar organizations. This may include unlabeled or mislabeled products, rejected products still safe for human consumption, discontinued items, off spec items, damaged items, close-dated items, and past “best if used by” dated products. Donations of food are tax deductible, and The Bill Emerson Good Samaritan Food Donation Act protects good faith food donors from civil and criminal liability. Search for a food bank near you on the Feeding America website. Food waste can be used to feed animals. In Minnesota, food-to-hog programs are popular. Hog farms can obtain permits to use pre-consumer and post-consumer food waste as feed. These farms may offer services like pick-up at your facility and collection containers. These services are usually fee-based, though the fees are typically less than trash hauling fees. Learn more at the MnTAP webpage Feeding Food Processing By-products to Livestock. 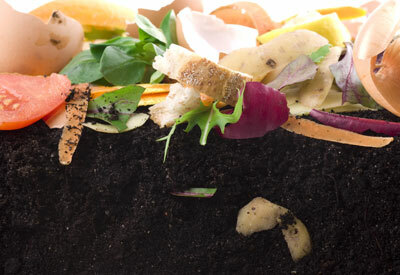 Food and other organic waste can be recycled into compost. Food can be mixed with other organic materials, such as compostable plastics and paper products, and sent to a composting facility. This is often called organics recycling. More and more waste haulers are offering organics pick-up as a service. Besides the environmental benefit, recycling in the State of Minnesota is exempt from the solid waste tax of 17% for commercial entities. Removing organic wastes from your dumpster could also help you reduce the frequency of trash collection or the size of your dumpster, which could reduce your trash bill. However, to make organics recycling feasible, your business must be located near a composting facility that can process the material (or be willing to compost on-site). The Minnesota Pollution Control Agency maintains a list of facilities on their Compost Facilities webpage. Learn more about compost here. Producing food is a resource-intensive endeavor. When we waste food, we waste all of the inputs that went into producing the food at every stage of the process, from the water that goes into growing crops to the energy used to process and transport foods across the globe. Thirteen percent of greenhouse gases in the United States are associated with growing, manufacturing, transporting, and disposing of food*. In addition, landfills account for 20 percent of U.S. methane emissions, and food in landfills is a significant source of methane. Call MnTAP today to investigate ways to reduce, reuse, and recycle your food and other organic wastes.